I am on creation form and want to add video to this form. I press + and the video gallery is opened in a popup. I need to select video and submit. Is it okay to name submit button as Select? Or are there any better options like - Done, Save, Choose, Open...? Trying not to use generic labels like Ok / Cancel, but name buttons after what they actually do. ...but name buttons after what they actually do. This might seem pedantic, but looking at the screenshot the "Select" button doesn't select the video, it confirms a previous selection, presumably by the user clicking one of the videos, etc. You might want to use the verb that your application will perform, such as Edit, Delete, Play, etc. Or stick with OK / Cancel, where OK is likely disabled until a selection is made (this is a well understood standard). Take a step back here, do you need that button at all? The title of your dialog asks the user to "Select video", which they do by clicking straight on the video. Isn't that good enough? Do they really need to move their mouse all the way down to bottom right after this to click another button? Now, if your workflow involves selecting multiple videos (I doubt it, based on that dialog title), I could see the need for an "I'm done" click. Other than that, though, I would say let them go straight to watching the video (or whatever action your app takes from that point) with only one click. Well, let's step back a little. What is a person doing when they interact with the image based control? What is a person doing when they interact with that button? Personally, I would say, they are confirming their selection they previously made, thus one potential wording would be something like "Confirm Selection". The primary alternative, to me, is that they are now "Done" with making their selection. I try to avoid using "Done" as a single word by itself in multi-stage tasks, as it sometimes becomes contextually unanchored: Am I, as someone using the application, "Done" altogether, or just "Done" with this stage? "Done with selection" or "Done Selecting" is one way to word that with a firmer specific context. "Save Selection" also works in a modal context, but it also carries some implicit nuance where someone may then expect to be able to later edit their selection. If there is only a single video being selected and there is a way to return to this selection task screen (back navigation of some kind, or editing this selection later), then I would definitely agree with @N.H.'s answer about removing this button altogether. 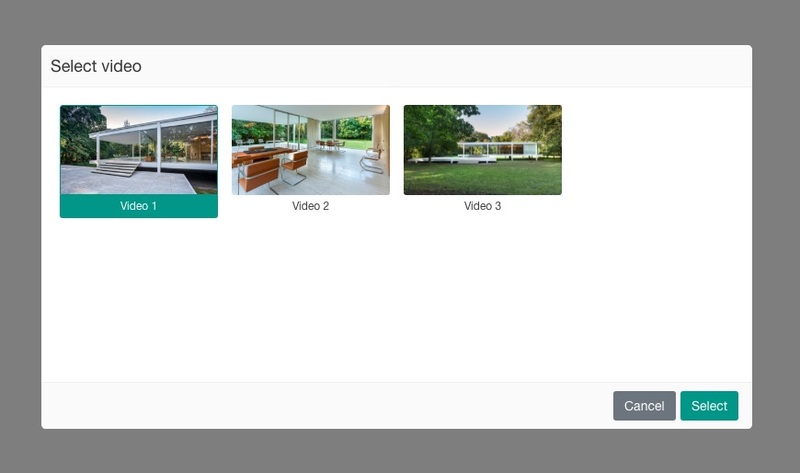 Interacting with the video selection control is plenty to indicate intent. What about this screen's prompt itself? But before I let it go at just that: I really feel like you may wish to back up even further and consider the language of your prompt. "Select a video" is very generic, and presumably worded from the perspective of the system (e.g. what do I, as the developer, need "my users" to do for me at this point), rather than what the person using it hopes to achieve/is engaged in doing. Are they here to choose a video to watch? Are they here to choose a video to edit. Is this part of a survey and they're indicating which video they preferred? What is the person doing that brought them to this screen? What is their intent? Why are they here? What are they indicating with each control interaction (versus what you are having the system do as a reaction)? Flip the perspective to that and a lot of the language becomes much easier to discover. It's hard to give better advice about possible alternatives for your task completion control when the task itself is so generically labelled. I'm inclined to think that if your prompt were worded in a way that was more anchored in the person engaging in the task's perspective, the completion control would be easier to word accordingly and sound more contextually specific rather than so generic, which seems to be one root of your question here. But is "Select" okay as completion button text? Generally speaking, you certainly "can" name your submit button "Select". But you can also just as well name it "Ok", at that point. I would even say that if you are ending up in a situation with generic terms for signaling task completion, you may as well go with whatever is the most standard for the sake of global consistency, rather than trying to pick something else for possibly the wrong reasons. "Continue" is also common in many multi-stage task interfaces like wizards, surveys, etc. At the very least, though, "Select" does match the language used for the screen's prompt, so that's internally consistent. At the same time, if that seems generic, maybe that means your focus is in the wrong place, given where the button's text is actually deriving from (the task prompt). To me, arriving at this question points to needing to back up a step in how you're approaching your language use and crafting an interface that's intended to focus on the perspective of the person using it rather than the data/input needs of the system from a development perspective. Rewording the task prompt from the appropriate perspective would likely inform a better corresponding wording for the task completion control. DRY - don't repeat yourself. If your dialog is titled "Select video" I wouldn't place "Select" again on the bottom but keep with the standard "OK". Furthermore, I'd use double-click to select the particular video immediately (i.e. without the need to click on the confirmation button below). And one more remark concerning the dialog itself - is it possible to keep the dialog size adjusted to the content? What I mean is that now there is a lot of unused space and the "OK/Cancel" buttons are outside of the user's primary field of focus (which is somewhere near the videos). If you make the dialog smaller it would be easier for the users to spot the confirmation/cancellation buttons. Looking at what youve attached something like 'Next' or 'Continue' or something along those lines may be more apt, as the button doesnt select the video, the act of clicking the video itself is selecting it. Buttons communicate the action that will occur when the user touches them. I don't see a problem with the text, with "Select" if this is what the button does, but from the design my conclusion it actually has the role to confirm the action of choosing an option. In this case, you can use "Confirm", "Get started" if it is the first step of many, "Continue" or "Save". Given user is opening this popup by pressing + to attach video and I assume they can make multiple selection. As + resembles the addition in this context, I would go with "Add". Also the primary task on popup is addition, cancel is just escape mechnaism so I would put "Cancel" after "Add. In 95% of all cases like yours, you "select" something with another purpose than simply to "select" it. If you want a custom name for the button, use that other purpose for the name. Also keep in mind intuition, which is really just familiarity. Users are familiar with certain keywords such as "OK", "Done", "Save", "Confirm", "Attach". Use the familiar words, unless your word is clearly less likely to be misunderstood by your users, some of which will be non-native speakers. Speaking of familiarity, "select" is sometimes used in context of "select this one", not "confirm my selection". In your example that would mean having 3 "select" buttons, one for each video. You're showing them a dialog so they can select something. Once they've selected something, they can either cancel out of it - or they can Accept their selection(s) and proceed with whatever it was they were doing. or you can let them Confirm their selection(s). "Save" if that is what "Success" action does in this case. I would "Select" on click of the video (and close the dialog). "Cancel" can be achieved with "X" in the corner of the dialog. When labelling a button - you should think about what the result of clicking that button will be. In this case, if the user clicks the button and those selected videos will be attached to some kind of post/upload, then the label should be "attach selected videos". If this is not the final step in the process, then it could be "attach selected videos and continue". Not the answer you're looking for? Browse other questions tagged buttons labels popup submit or ask your own question. Save vs. Submit - Clone the [Original] Record on Submit?